My new Syrian friends invited me to dinner in Jordan one night. In their airy white apartment we ate kubba nayeh, a dish native to their village in Idlib, we watched their children play and talked about the war. In the early years, they told me, every time they learned of the death of a family member, a friend or a neighbor, they were shocked and devastated. Now, six and a half years into the war, they are no longer shocked. They and their loved ones who are still living in their country have become desensitized to the war in Syria. Deaths and bombs and fighting no longer have intense impact. The war has become boring for them. They care about their country and they care about their lives, but now another death is just another day. 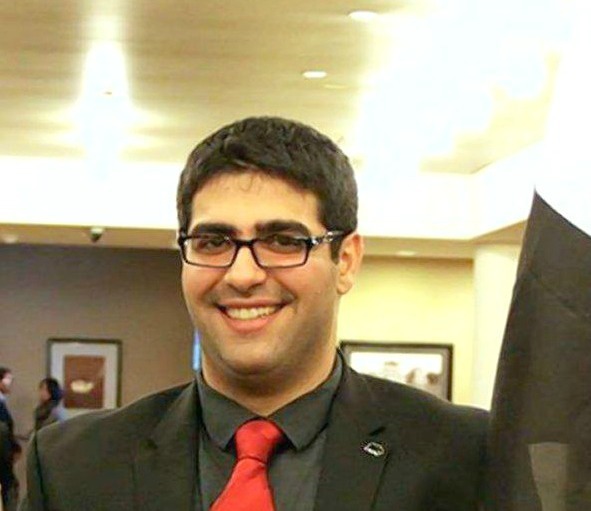 30-year-old Jamil came to Jordan alone in July 2011, shortly after the Arab Spring began. When the instability after the protests began to spread and civil war ignited, he returned to Syria, got his wife and 13-month-old daughter, and brought them over the border into Jordan. Jamil’s mother, older brother and sisters still live in Syria. They have to travel for hours to get an internet signal, but at least internet in Syria still exists. Before we sat down to dinner, his mother left a voice message on What’sApp to ask him how he’s doing, how his work is going, if his children are doing well in school and to let them know she is still alive. I first met Jamil in a shop in Madaba, Jordan where he creates mosaics with Syrians, Jordanians and Egyptians. 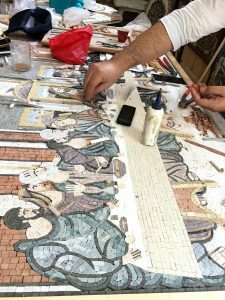 While I watched him working on a mosaic of the biblical Last Supper, he talked to me about life before the war. People were taking sides in Syria even before the Arab Spring, Jamil says. Many years earlier the country had divided into the government against the people. Often a person would take one side and later switch to the other. Gathered on the streets holding olive branches in their hands, people began holding peaceful demonstrations. The government then began sending soldiers to kill them. People who had lost their families started carrying guns. Twenty and thirty years ago this was a small problem, and not many people in the country could feel it. But throughout the years it grew and grew. Soon everybody was carrying guns in some areas, such as Idlib. “Then everyone could feel it,” Jamil says. Before the war Jamil worked many jobs. He drove a transport truck. He made shoes. Most of the time he created mosaics. In order to get a private sector job you had to know someone. A good job with the government was very difficult to get because you needed to know someone big. And you had to be on their side. Ordinary people couldn’t get jobs. This was one of the problems that caused the protests which led to the war. On the streets of Idlib even before the protests it could be difficult to get anywhere. If you ran across someone who was aligned with the government or someone who was aligned with the opposition, they would stop you and not let you pass. They would try to force you to agree to join their side. “You could not say no” Jamil says. Even if you were truly neutral and told them so, they would think you belonged to their enemy. “You say yes or they will kill you.” Jamil began staying home most of the time. Unlike most people in Syria, the house of Jamil’s family does still exist today and they are still able to live in it. The house is the reason that his mother is in Syria now. Jamil brought her to Jordan in 2013, but she missed her home in Idlib and wanted to go back. Hoping and praying that the war would end and never thinking it would get this bad, she returned to Syria in 2015. Now she wants out, but there is no country that wants to take her and the rest of Jamil’s family. Many of Syria’s remaining people are in Idlib now. The war pushed them into this region. It was one of the final relatively safe places in the country. But now since so many people have fled there, much of the bombing is focusing on them. Long-term struggling has caused Jamil’s people not only to be desensitized to the war in Syria but to develop a different sense of suffering. What used to be major problems, like no electricity since 2012 except for generators, have become minor problems. The biggest problems now are those that are hard to live through, like illness and injury. People who need a hospital can’t go to a hospital because their hospital has been destroyed. Jamil’s family does still get to go to work and to school sometimes. When the bombings stop, they are able to leave the house and somewhat resume their old lives. When the bombings start again, their lives stop again. Six and a half years into the war, there are people in Syria who still aren’t taking sides. Now most everyone just wants it to stop. 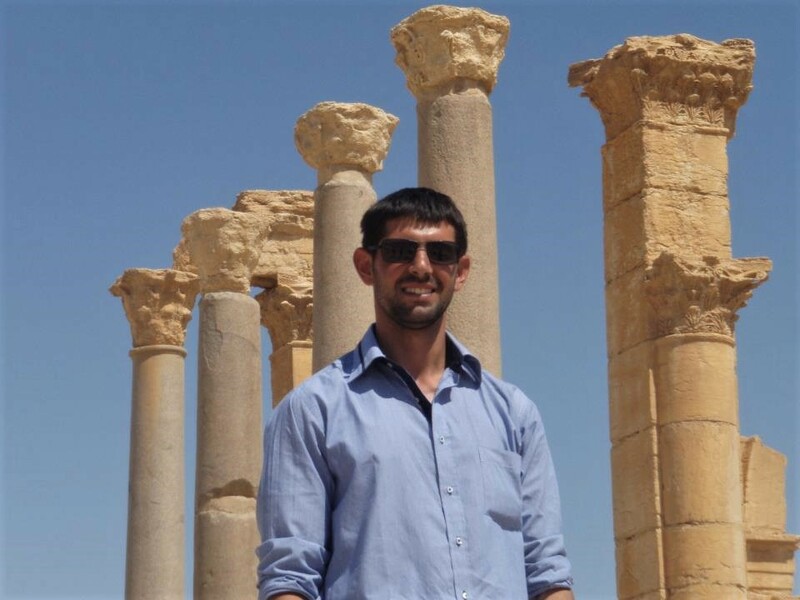 But Jamil, like most of the people in his country, does not think anything in Syria is going to be okay any time soon.